Pictured after winning the IHSA Class 2A Scholar Bowl Sectional on March 10 are Scholar Knights (front, from left) Taylor Goring, Mai Khuc, Nick Toennies; (back, from left) Drew Potthast, Ben Logullo, and John Hund. 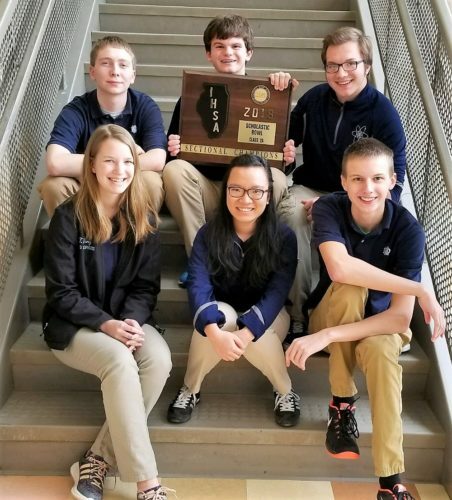 On Saturday, March 10, the Scholar Knights looked to capture the IHSA Class 2A Sectional Championship plaque, and with it, a trip back to the State Finals Tournament. The Knights began pool play facing the O’Fallon Panthers, who earned second place behind Mater Dei in the Metro East Quad League. Despite the Panthers converting forty points on the first question, the Knights grabbed a 160-50 lead after six questions and continued to lead 230-140 at halftime. The Knights’ score ballooned during questions fourteen through seventeen, and Mater Dei defeated O’Fallon 460-300. In round two, the Knights faced South Central Scholastic League rival Greenville. Mater Dei set the tone early, grabbing a 60-10 lead after two questions. The Knights converted eight of twelve first-half toss ups to build a 240-80 lead. Early in the second half, the Knights went on a scoring barrage and extended their lead to 360-80. The Comets tried to narrow the gap down the stretch, but the Knights cruised to a 490-170 victory. With the Sectional Championship on the line, the Knights faced the Carbondale Terriers in round three. Mater Dei struck first, converting all forty points of question one. Carbondale struck back and pulled ahead 70-40 after question three. The lead bounced back-and-forth between the teams throughout the first half, but Carbondale took a 220-160 lead into halftime. The Knights chipped away at the Terriers’ lead early in the second half and finally claimed a 270-250 lead after sixteen questions. The lead was short-lived, though, as the Terriers converted questions seventeen and eighteen to seize a 310-270 lead. Mai Khuc converted question nineteen, and the Knights swept the bonus to tie the score 310-310 with five questions remaining. The momentum swung the Knights’ way at question twenty, as sophomore Taylor Goring came through with an early buzz to convert and give the Knights a 340-320 lead. John Hund extended the Knights’ lead to 370-320 with two questions remaining, as he converted toss up twenty-two. Carbondale still had some fight in them, though, and the Terriers converted question twenty-three to keep the match within reach at 380-340 heading into the final question. With the Terriers needing to sweep the final question to send the match to overtime, Ben Logullo rang in successfully on a Fine Arts question to seal the victory, and the Sectional Championship, 400-340. For the tournament, Ben Logullo led Mater Dei with twenty toss ups, followed by John Hund (12), Mai Khuc (7), Nick Toennies (4), and Taylor Goring (1). Drew Potthast also contributed to the victories. With the win, the Knights will take their 77-12 record to the IHSA Class 2A State Finals Tournament at the Peoria Civic Center Friday, March 16 for matches with Chicago Latin, Rockford Auburn, and Orland Park Sandburg.